Get ready to run amuck, amuck, amuck with these great “Hocus Pocus” movie night ideas for some Halloween family fun! 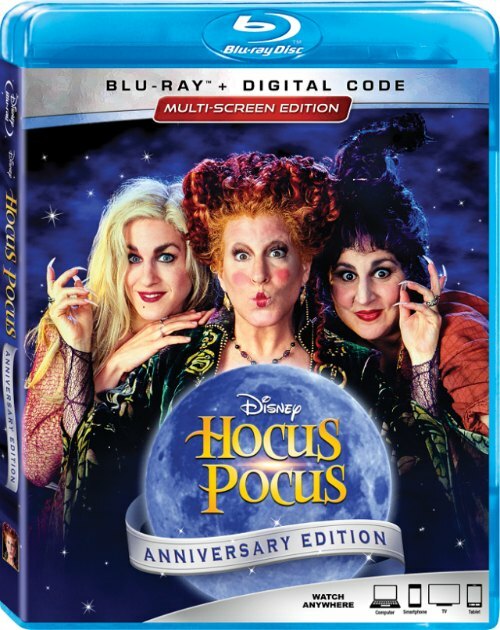 One quarter of a century ago, three 17th century witches—Winifred (Bette Midler), Sarah (Sarah Jessica Parker) and Mary Sanderson (Kathy Najimy)—brewed the perfect magical movie for the whole family: Walt Disney Pictures’ live-action comedy/adventure “Hocus Pocus.” Dost thou comprehend? I mean, REALLY – 25 years ago?! I can’t believe it! So, in celebration of the release of the film’s 25th Anniversary edition, we’re sharing some tasty recipes and ideas to help you have a spellbinding movie night! Brew up a few of those recipes and you’re sure to set the right mood for your Hocus Pocus movie watching! And speaking of the movie, read on to find out all the fun details in the anniversary edition! In celebration of the film’s silver anniversary, “Hocus Pocus” was just re-released (Sept 2, 2018) in a spellbinding new way to experience the film: the Trivia and Treats Edition. How perfectly does that go along with the treats shared above?! Love it! I LOVED this movie when I was a kid (really more like a teen 😉 ), so I’m thrilled to have gotten a copy of this anniversary edition to review – even if I am still in shock that it came out 25 years ago! Gah!